The AntennaTracker Project delivers firmware which allows you to use a supported flight controller board (Pixhawk, APM2, etc.) as the controller for an Antenna Tracker. The tracker calculates the position of a remote vehicle using its own GPS position and GPS telemetry from a vehicle running Copter, Rover or Plane. It then uses this information to aim a directional antenna at the vehicle. 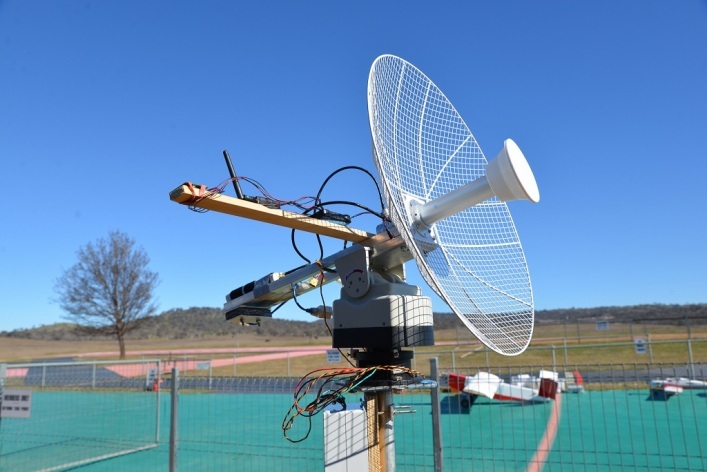 Using a correctly aligned directional antenna significantly improves the range over which signals can be both sent and received from a ground station. If your a developer wanting to work on AntennaTracker please join the ArduPilot gitter chat channel which can be found in the Community menu above. If your a user looking for support on the AntennaTracker please go to the support forums which can be found under the Community menu above. Below is Canberra UAV’s tracker used during the 2014 OutBack Challenge. This manual will guide you through setup and configuration process.